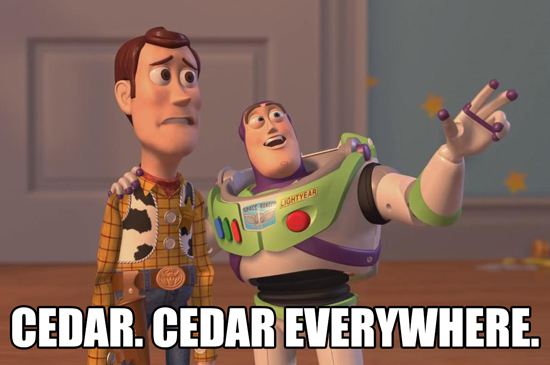 Suffering from cedar fever? So is your HVAC system. For those of us who suffer from cedar allergies, living in Central Texas can be a nightmare this time of year. What many of us don’t consider is that our HVAC systems can suffer from cedar (and other pollens) as well. Taking steps to minimize cedar pollen in the home will not only help allergy sufferers but also the performance of the HVAC system. Controlling pollutants such as cedar pollen is best achieved using a three-pronged approach: ventilation, filtration and PHI generators. In this discussion, we’ll cover ventilation. Getting outside air into the home generally isn’t a problem. In fact, not many years ago, homes were built “loosely,” and this allowed lots of outside air to infiltrate the home. But alas, too much of a good thing is bad. What happened was this outside air leaked in through many nooks and crannies. In other words, it was uncontrolled. This air coming in brought with it all the pollutants from the outside: pollen, dust, plant matter, etc. Once in the home, these pollutants stayed put — wreaking havoc on our families and creating a huge amount of unconditioned air that had to be heated or cooled. What we need is a way to bring in the correct amount of outside air and to control the quality of it. This is called ventilation. Bringing in controlled outside air is important to the health of our homes, which is important to the health of our families. The first step in achieving this is to test the home for leakage. We do this with a blower door to determine the amount of leakage the home may have. If it is determined to be too much leakage, we will seal, or weatherize, the home to stop the excessive leakage. Then, we will install an outside air duct to supply the correct amount of outside air to the home. Control the amount of outside air using dampers. Control the quality of outside air using filters and PHI generators. Control the health of our home and families. We also need to condition that air. PHI generators don’t work on pollen, but filters do. And, since we can now isolate the outside air coming in, we can add an effective filter to help keep it out of the home.